True due to the vagaries of the browser's rendering. I'll have another go at some stage. muzik wrote: Just one more neighbourhood suggestion: how about a 15-cell neighbourhood that also includes these three cells at the very tips, giving a perfect triangle instead of a wonky hexagon? This should be better now. Still faintly visible, but far better than before. Will it be possible to determine cell border thickness? Could the "Ctrl+C to copy pattern" thing be put in a more obvious spot, perhaps by "Click to control" when you hover over the viewer? It's such a useful command (especially on the wiki) that it probably shouldn't be buried so far down in the help menu; it took me several months before I even bothered to try it out. An idea I've had for a while: for rules with aliases, when the T counter in the bottom left is clicked, could the alias text link to the rule's Catagolue page? Drawing on the triangular grid seems to act as if the triangles were squares. The viewer seems to be scaling bordered hexagons a lot weirder and blobbier as of late. Gamedziner wrote: Drawing on the triangular grid seems to act as if the triangles were squares. True. The drawing routines don't know about triangles yet. It's also true for hexagons but less easy to spot because they're more square. One solution to this would be to change the triangular rule suffix to "TR", meaning only badly formatted rulestrings will be parsed this way. Also the lower pattern seems to be shifted when I open it. Good catch! Unfortunately "TR" won't work either since both "t" and "r" are valid non-totalistic modifiers. It also means that "TE" needs changing since "e" is also a valid non-totalistic modifier. Will LTL be able to support higher-range hexagonal neighbourhoods? muzik wrote: Will LTL be able to support higher-range hexagonal neighbourhoods? Not planned. Plus it doesn't support range 1 hexagonal. 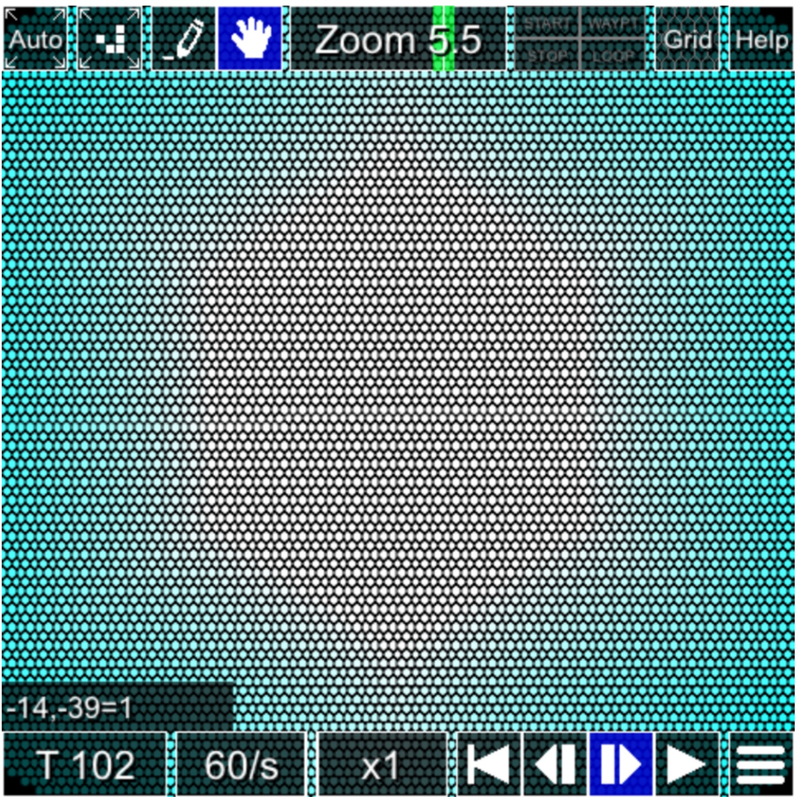 Actually they become squares below 4x zoom. It's the same for hexagons. 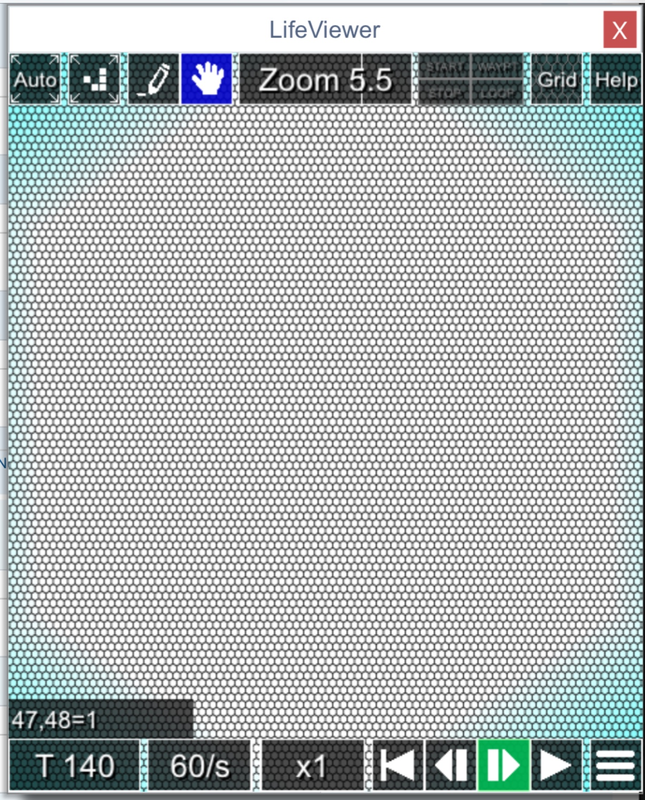 That's also the zoom limit for displaying grid lines (if enabled). Other rule families seem to work normally. Fixed in the next build, thanks. Will lifeviewer be able to simulate multistate one-dimensional rules?